Washington State Patrol troopers are reporting that an estimated 17 vehicles were involved in a massive car accident on Friday morning. 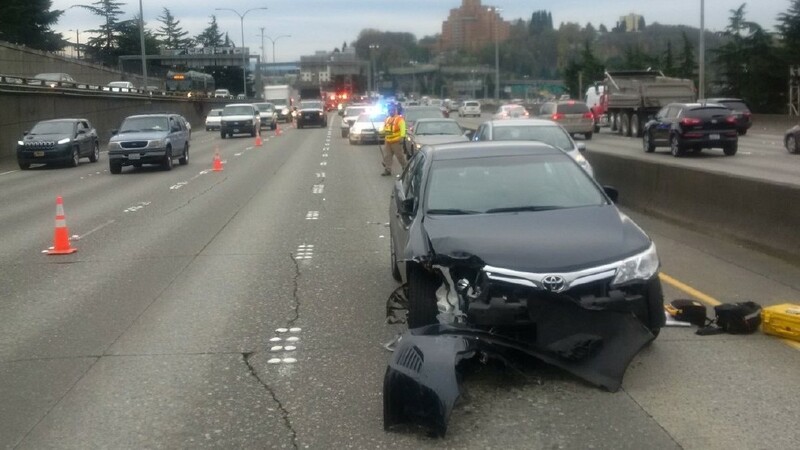 The incident happened on Interstate 5 at approximately 9 a.m. near East Yesler Way in downtown Seattle. Two northbound lanes of the interstate were closed while investigators examined the scene and cleared the roadway. According to Trooper Rick Johnson, the massive incident was caused by one woman driving a 2012 Toyota Camry. She apparently began driving erratically on Martin Luther King Jr. Way, and her spree of crashes ended on Yesler Way. Her car eventually came to a stop because it was too damaged from multiple crashes to be driveable. Emergency responders believe that she may have been having a psychotic episode that caused her to behave erratically on the road. She has been taken to a Harborview Medical Center and will undergo a psychiatric evaluation. Police do not believe that drugs or alcohol were factors in her erratic behavior. One injured driver received treatment at the scene. Emergency responders are still working at the scene, and did not have information immediately available about the condition of the other drivers who were struck.